The lower terrace is flooded in the spring often. 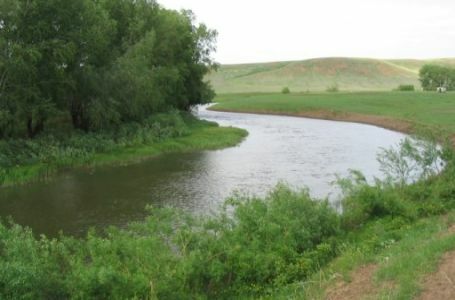 The position of the river bed can change. The upper terrace lies higher and is not flooded ordinarily. All villages established on the bank of Tock are on this area. This terrace probably formed in prehistorical time, richer in water, the flood area of the Tock. 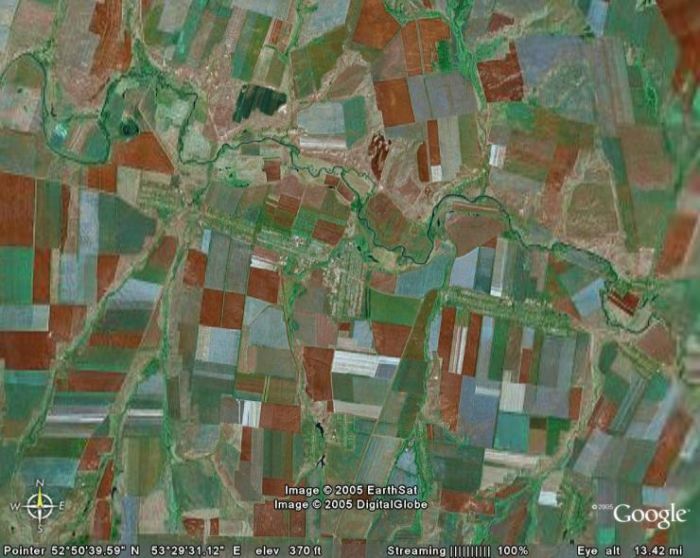 The ground in this area is more fertile then farther to the south. One cannot farm the lower terrace, named also "Plauwinj", and it can be used only as a meadow, in which many flowers grow, e.g., yellow may tulips, lilies, crokuses, and violets, but also berries like blackberries, currants and strawberries. In those days, therefore, it was not bought by the colonists. After the upper terrace the plain rises further on a length of about 12 kms. The Tock lies at a height of about 90 ms, while the divide, separating river systems of Tock and Malij Uran, is at a height of about 200 ms.
River of Tock near Pleschanowo, in 2004. This gently rising plain is interrupted by the sometimes very precipitous gulches of the tributaries. Near the divide she rises again more precipitously, but the border of the land bought by the colonists runs farther to the north. Therefore the area on which the Neu Samara settlement was founded is suited just and well for the agriculture, in contrast to northern bank of the Tock, where the Bashkir live. Before the colonists came there was only a treeless steppe. Only they have planted trees, for what they were also obliged by the way, every colonist should cultivate on 1/2 Desj. of his farmstead wood. Today the streets and the borders of yards are hemmed by trees: poplars, maple trees, pastures, lilacs, field elms, pea shrubs as well as currant bushes. Between the single villages there are wide forest stripes. One can recognize the village Kamenetz, deserted today, still by the trees and bushes, overgrown now. Every settler had a garden with fruit-trees. 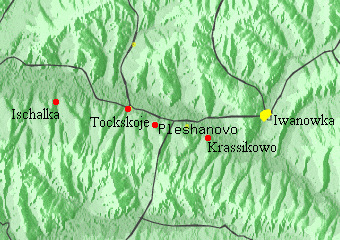 The highest elevation near is Vanyakina Shishka, 300 ms high and about 12 kms to the south of Bogomasowo. At the foot of the mountain Otnaschka and Enkla have their source, they flow between Bogomasowo and Dolinsk into the Tock. The climate is marked continental: the winters are long, cold and snow-rich - the summers are hot and dry. The winter starts already at the middle of October with the first snowfall. It forms fast a thick snow cover. Till the 50-th there were house-high snow drifts. Because the settlement lies in a treeless steppe, the blizzards, named on Russian "Buran", find no opposition . Gigantic snow masses whirl in the air and close up eyes and nose. Only in April the spring starts with snow melt. The glaze water fills in rivers and brooks and lets them overflow for weeks. 80% of the total annual quantity of water of the Tock flow in this time. In the rest of the year the water-level is low. The summer is mostly hot and dry with rare but heavy rain falls. Because the streets mainly are not asphalted, there are after the rain gigantic aquatic laughters. The precipitation is low with 300-400 mms per year in comparison with Germany with more than 800 mms, the biggest part of it fells in winter as a snow. During the period 2000.09.03-2004.08.03 was, according the data from a meteorological station in Buzuluk, which is about 80 km away from Pleschanowo, the highest temperature 34 degrees Celsius and the lowest temperature -35 degrees Celsius. There is in average a perception of 445 mms per year.